Pultruded Fiberglass Grating is the ideal solution for platforms, ramps, stairs and more. This grating is slip-resistant, non-conductive, strong, lightweight and corrosive resistant which makes it ideal for many industries. 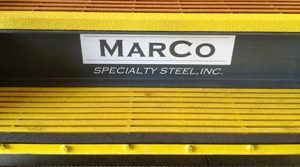 Here at Marco Specialty Steel, we’re an industry leader in intelligent grating solutions for a broad range of industrial applications. We offer both pultruded and molded FRP products to better serve your needs and to be sure to have the FRP grating that suits your application and expectations. Both molded and pultruded gratings are available in phenolic which is best in high heat or when fires can occur. Pultruded Grating is available in two resin formulations for an accurate match of product characteristics with the application. Both resin systems provide corrosion resistance that is superior to that offered by metal grating. Isophthalic Polyester (Type I): Isophthalic polyester resin formulation with a low flame spread rating of 25 or less designed for applications where there is moderate exposure to corrosive elements. (DNV Type Approval). Vinyl Ester (Type V): Vinyl ester resin system with a flame spread of 25 or less for dependable resistance to both acidic and alkaline environments. Phenolic (Type P): A Coast Guard approved flame-resistant phenolic resin with an extremely low flame spread of 5 or less and a smoke index of 45 or less – designed primarily for the offshore industry. (Coast Guard approved for Level 2 performance criteria – DNV Type Approval Certificate ABS Product Type Approval). Our pultruded FRP range includes several standard widths that fit common platform dimensions (including 24”, 36” and 40” and 48”). We offer a range of lengths that can be used as-is or cut down using simple hand tools for your installation. If necessary, we can also offer custom solutions that are based on your drawings, blueprints or print takeoffs. We’re not just a supplier — we also custom fabricate our own fiberglass-reinforced plastic grating products. That gives us greater control over the quality of our products and the amount of customization we can offer. Weather you need a simple notch or a customized FRP mezzanine, Marco has technical experts to help. 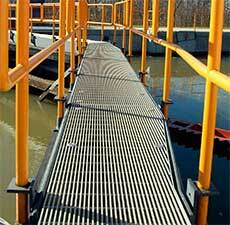 Strength: pultruded grating products offer superior strength and stiffness. Since glass is the key contributor to structural performance, pultruded offers the highest strength to unit weight ratio. Corrosion Resistance: The degree of corrosion resistance for pultruded grating is superior to stainless steel, aluminum and galvanized gratings. Fabrication Features: Many panel sizes allow for greater use versatility with longer spans which may reduce scrap loss. 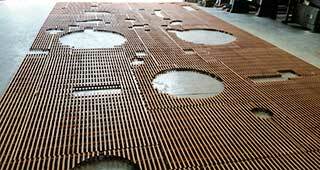 Safety Surface: The walking surface of most pultruded grating have a coarse epoxy grit bonded to both the bearing and cross bars (unless noted). Pultruded fiberglass grating is manufactured by assembling two structural fiberglass shapes (cross and bearing bars) into a grid pattern. These bar shapes are made by a pultrusion – a continuous molding process utilizing glass or fibrous reinforcement in a polyester or vinyl ester resin matrix. Selected reinforcement materials like glass strands, mat or cloth are drawn through a resin where the material is thoroughly impregnated with a liquid resin. The fibrous laminate is formed to a geometric shape (T or I) and pulled through a heated steel die. The laminate solidifies into the exact shape of the die cavity as it is being continuously pulled by the pultrusion machine. Once you have your perfect pultruded product you will need to choose fasteners, and we are here to help. These are short descriptions, or go to our fasteners page. Type M, 316 stainless steel hold down clips used to secure panels to a support using two adjacent grating bars for a secure fit. Type G, stainless steel hold clips designed to attach grating to any structural member flange, 3/4″ or smaller in thickness, with no drilling required. Type T 316 stainless steel flange blocks fit inside close mesh products allowing for installation of cap screws from the top surface of the grating. Type J fasteners offer effective support for light duty loads. 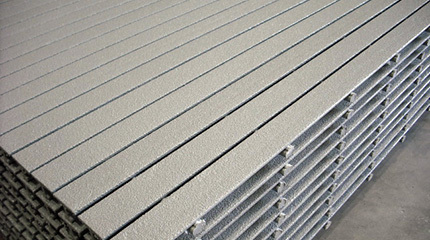 Marco Specialty Steel has a large inventory of stair treads in different materials. FRP Pultruded stair treads are among the favorite to our clients who need a slip-resistant surface that can stand up to wet or slimy conditions. 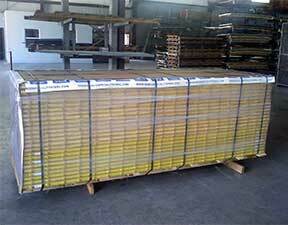 They are coated which increases the resistance to chemical corrosion and continuous UV exposure. 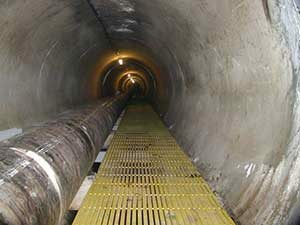 This coating is a coarse epoxy which is non-skid and enhances traction making it safer. Simply email your files to our our experienced design team will find the pultruded FRP grating that works. As a manufacturer and supplier of our own products, we can offer you competitive fiberglass reinforced grating prices and the support of an experienced team that can answer your questions and provide you a fast quotation for your FRP grating project. You’ll find that our pultruded grating systems offer an excellent combination of strength and durability in a lightweight design Contact us for more information and to see if pultruded FRP is right for your industrial platform, stairs and grating requirements. Click for page 1" 6"
Click for page 1.2" 6"
Click for page 1.5" 6"
Click for page 2" 6"
Discover for yourself why so many companies have made Marco Specialty Steel their one-stop source for all their pultruded fiberglass grating needs. Contact us to learn more about our pultruded FRP product offerings today. And be sure to let us known about your specific requirements.